GARY KULESHA is one of Canada's most active and most visible musicians. Although principally a composer, he is active as both a pianist and a conductor, and as a teacher. Mr. Kulesha's music has been commissioned, performed, and recorded by musicians and ensembles all over the world. His "Angels" for Marimba and Tape has become a standard repertoire item for percussionists, and receives over a hundred performances per year. His works for Danish recorder virtuoso Michala Petri are toured by her throughout the world each year, and have been recorded on RCA Red Seal. Over 15,000 copies have been sold in Europe alone. Works such as "Mysterium Coniunctionis" for Clarinet, Bass Clarinet, and Piano, and the Sonata for Horn, Tuba, and Piano, are performed regularly in England and Europe, and are often taught as part of performance curricula in these places. "Celebration Overture" is one of the most performed orchestral pieces written in Canada. "Four Fantastic Landscapes" has entered the repertoire of several noted pianists from Canada and Europe. Mr. Kulesha's first opera, "Red Emma", was included in Opera America's book of "Operas which should be performed more often", beside works by Copland, Bernstein, and Weill. In 1988, he was appointed Composer In Residence with the Kitchener-Waterloo Symphony Orchestra, a position he held until 1992. In 1993, he was appointed Composer In Residence with the Canadian Opera Company, a position he held until the end of 1995. "Red Emma" was premiered on Nov. 28, 1995. On Sept. 1 of 1995, he was appointed Composer-Advisor to The Toronto Symphony Orchestra, where his duties include composing, conducting, and advising on repertoire. In February of 1998, the TSO premiered his "Symphony" for two conductors and orchestra, with Jukka Pekka Saraste and Gary Kulesha conducting. In winter of 1999, the TSO took his work "The Gates of Time" on their American tour. In February of 2000, the TSO premiered "The True Colour of the Sky" in Toronto, prior to taking it on their European tour. As well, the TSO presented the Symphony again, in November of 2000, as part of the Massey Hall New Music Festival. The Symphony was awarded a prize at the Winnipeg Symphony New Music Festival in 2001 as Best Canadian Orchestra Composition of the 1990s. The Symphony opened the Vancouver Symphony Orchestra's 2001-2002 season, on a programme with Beethoven's 9th Symphony. In November of 2000, Music Canada 2000 premiered his second opera, written in collaboration with librettist Michael Albano. In March of 2005, the Toronto Symphony Orchestra premiered Second Symphony, conducted by Oliver Knussen. In November of 2006, Shauna Rolston premiered Concerto for Cello and Orchestra with the Vancouver Symphony Orchestra conducted by Bramwell Tovey. In May of 2007, the National Arts Centre Orchestra premiered Third Symphony, conducted by Roberto Minczuk. On March 19, 2002, Mr. Kulesha was one of three composers awarded the first National Arts Centre Orchestra Composer Award. This began an extended relationship with the NACO and its Artistic Director, Pinchas Zuckerman. Mr. Kulesha has toured twice with Mr. Zukerman and the orchestra, and has written several works for them. In 1990, Mr. Kulesha was nominated for a Juno award for his "Third Chamber Concerto." He was nominated again in 2000 for "The Book of Mirrors." In 1986, he was named Composer of the Year by PROCanada, the youngest composer ever so honoured. Also in 1986, he represented Canada at the International Rostrum of Composers in Paris. In the summer of 1990, he was the first composer ever appointed to the position of Composer In Residence with the Festival of the Sound in Parry Sound, Ontario. He continued to direct this programme from 1996 until 2004. In July of 1998, Mr. Kulesha was, with Krzystztof Penderecki, one of the two Composers in Residence at the Banff Centre's summer session. He returned to the Banff Centre in 2002 as a Fleck Fellow, to direct the chamber orchestra programme. He returned again in 2004 and in February of 2005. Mr. Kulesha has directed the National Arts Centre Orchestra's Young Composers Programme twice, and is scheduled to return in the summer of 2007. An active supporter of young composers and performers, Mr. Kulesha was the Artistic Director of The Composers' Orchestra from 1987, stepping down in 2004 in favour of three young composers. His conducting activities are extensive, and he has premiered literally hundreds of works. He has guest conducted frequently with several major orchestras throughout Canada, and has recorded for radio and CD. Although he is well-known as a specialist in 20th Century music, his repertoire is extensive, ranging from little-known Baroque music through to the music of our time. Mr. Kulesha was one of the chief architects of the Massey Hall New Music Festival, which ran for 7 years from 1995-2002. He is currently assisting Toronto Symphony Music Director Peter Oundjian with the design and programming of the Toronto Symphony's New Creations Festival, the most successful new music festival in the history of Canadian music. Mr. Kulesha is on the fulltime faculty of the Faculty of Music at the University of Toronto. 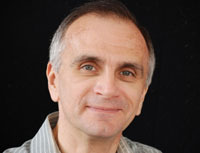 Gary Kulesha lives in Toronto with his wife, composer Larysa Kuzmenko.